There was a time when I enjoyed Hollywood films – not so often recently, admittedly – and saw every major film that got released. It was possible to grow up steeped in Hollywood culture. Certainly, it thrilled me as a child. Now, though, when I see things like this I’m merely depressed. The poster for ‘A Good Day to Die Hard’ features a father and son bonding over enormous guns. In the wake of recent school massacres, this seems like a grotesquely offensive joke. As far as I know, the poster wasn’t used in the US – perhaps someone can tell me otherwise. Gun culture isn’t part of our lives in Europe, and yet still Hollywood films still glorify gun violence, even going so far as to suggest it’s the best way to connect with your kids? What kind of topsy-turvy planet is Hollywood on now? Let’s not even get into the racial stereotyping that usually exists within such movies. I’m really not the overly sensitive type, and rarely feel the need to complain – we all see a lot of unacceptable things in our lives – but apart from anything else this approach to filmmaking feels out of date and out of step with the world. In the 1980s we were less sophisticated, and using such imagery now feels deeply wrong. This hasn’t gone unnoticed in the UK. Here’s a cringingly funny piece about the film by the two comedian-commentators discussing Willis’s recent PR jaunt here on ‘Charlie Brooker’s Weekly Wipe’. I just wonder if I am getting too old. Growing up in the eighties, I was a huge horror fan, and the most exciting thing was to get a copy of some 8th generation VHS of a genuine video nasty (the same films that are being given fanfare blu-ray releases now) and have stayed a lifelong horror (film and fiction)fan. The thing is, nowadays I find much of the violence seems linger on the suffering rather than the shock and I am out of step with it, I suspect films, as well as me, have moved to a different place. Don’t get me wrong there are still great thrillers and horrors being made, but its a real hunt to find them these days, and when I do, more often than not they are from outside Hollywood. well as throw away film fodder u could watch to pass a couple hours die hard did the job, but have to admit willis has gone down in my estimation after going on record film whilst promoting his new film, saying not long after the us shooting scandal that he though a ban on certain guns was wrong and that was unfair. as you could end up losing all your rights. OK, it was worth slogging through that video for the punchline. Surely you’ve noticed that Hollywood movies are meant to be nothing but thrill rides? This is what happens when money runs the world. It wants the shortcut to the fastest money. Long ago Wall Street MBAs flocked to Hollywood to run it. And this is now what we get. I stopped going to the pictures frequently in the late 60’s when the balance in the business began to shift away from a quality product that would make money to just harvest the money, money, money as fast as we can. Adult viewers soon began to dwindle as a result and film makers began redirecting their focus to the teens and early twenties. And the money men in order to protect their investment insisted on protecting their funding by using the “cookie-cutter approach” to product. Right after this the digital boys came in and acting mostly went out. Yawn. Best quote of last week? After viewing the many mobile videos of the Russian meteor crossing the morning sky and booming to bits with windows taken out all over, someone texted: “Russian meteors leave Hollywood in the dust everytime!” T’ was true. 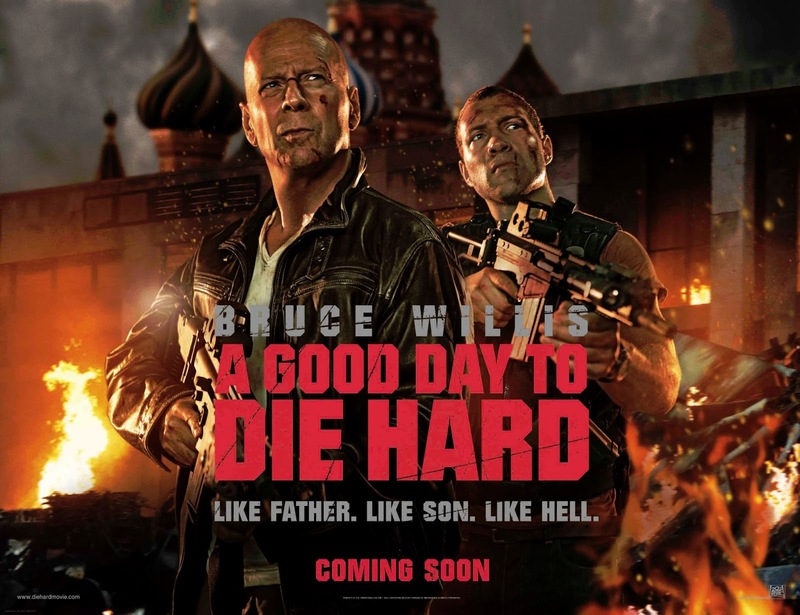 Chris, the poster is the US uses a cropped version of that poster with the father and son using the same weaponry. Oddly enough, it does not show the Kremlin in the background, just an office building of some sort. That’s because we were 30 years younger. I don’t think that todays audience is any smarter than we were at their age. And despite the explosion of ways to consume film, the range of films available to them has shrunk considerably. Years ago TV companies would show film seasons, BBC and Channel 4 mostly, Kurosawa, Buñuel, Truffaut and so on. Was the ‘Moviedrome’ series really the last hurrah? [David, if you let me have one of your Werthers, I’ll trade you a nip of my Sanatogen]. David I know what you mean, the horror/action violence has to my mind become a lot more pornographic? (Saw, Hostel, etc…) However I think the biggest change was the result of becoming a father as I instantly became more aware and sensative towards those films content. Now the only movies I tend to enjoy, in those genres, are usually subtitled (Asian, Spanish and Scandinavian to name a few). I know Ken, I have two small ones and have to stop myself turning into Mary Whitehouse. I agree on the Scandinavian front so good films there, with far more likeable lead players. I will raise you to an Emva Cream snowy. May an American assume that “Emva Cream” is not applied to the face at night, but for brief use in the mouth? Emva cream, that has brought back a traumatic taste memory, that I thought I’d managed to completely block out. Ok-Ok, I’ll see your sugar laden, paint stripper, and raise you to a ‘Snowball’. [For those not familiar with the ‘Snowball’ it was the Granddaddy of the Alco-pop. A blend of Advocaat and lemonade, which sounds OK. Until some one explains what the ingredients are. People have been known to turn a funny colour, and run out of the room, when it’s revealed that they are drinking fizzy egg]. Germans like their egg liquor, which looks like it is, pours rather slowly, smells like Humpty Dumpty if he’d spent far too much time in a pub before taking his fall from the wall. I’d rather drink a sip of their Gold Water with has flakes of gold – real gold – floating in it. I have to say it… Babycham…. If we are going down the fizzy ‘pish’ route? There was a drink that was ‘All fur coat, and no knickers’. A fate that the young ladies who over-indulged could find themselves at risk of, if they were not careful. Only there was no fur coat. Snowy, that name ought to be a serious warning since it sounds so much like ptomaine. Advocaat is Dutch, isn’t it? I have no objection to fizzy egg since I like a good ‘nog myself. Sorry guys, but I went to see the aforementioned film at the week end and found it to be a riot of tongue in cheek fun. Surely you can see Bruce hamming it up so much that he’s got crackling. All I could see in his eyes was a wry smile and the revolving dollar signs with the thought behind going something like – If they want to pay me millions to make another one then I am not going to stop them. It was comic book filming in the tradition of 60’s Batman and I kept expecting to see speech bubbles with BLAM and SPLAT on them.